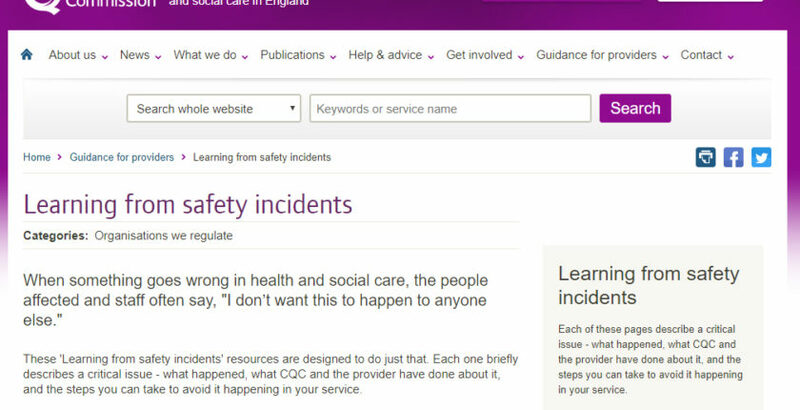 New resources have been launched by the CQC to help health and care providers learn from safety incidents. The first five resources in the series are designed to help care home providers ensure the safety and well-being of those they care for. Andrea Sutcliffe, CQC’s Chief Inspector of Adult Social Care, said: “When something goes terribly wrong in health and social care, the people affected, their families and carers often tell us, ‘I don’t want this to happen to anyone else’. And we know that’s how staff and managers feel too. “Of course, it is important that CQC uses criminal enforcement powers to hold providers and managers to account when their failure to provide safe care and treatment has such tragic consequences. But we also need to make sure we share the insight into what went wrong so that others can take practical action to avoid it happening to anyone else. Themes covered by the resources include: problems with the quality and use of risk assessments; issues with documentation; issues with equipment; and staff training. Press releases relating to CQC’s prosecution cases to-date are listed here.